This post looks at the results of combining several of the stock screens that we ran this weekend at TradeRadar. It seems refiners are doing well lately as last week we had Tesoro (TSO) on the list. This week it is Western Refining (WNR). Looking at this stock's financial ratios, one would not say this stock is particularly undervalued; however, the chart is extremely attractive (looking at it over a two period it looks like a nice bottom has formed and it has now jumped over its 200-day moving average) and it is comforting to see that it's one of our Cash Flow Kings. 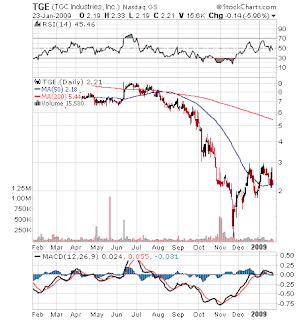 The best of this bunch is probably TGC Industries (TGE) which is in the oil and gas exploration services business. They have little debt and their financial ratios are all pretty favorable. This could be a nice longer-term value play. 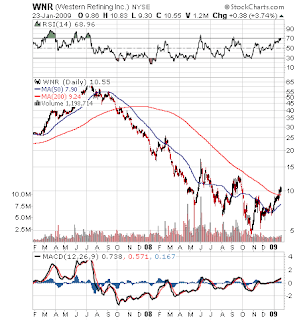 The chart below shows that the stock has fallen back to its 50-day moving average. It could get cheaper from here. If you'd like to download the whole list with added fundamental data you can use this link. There could be a few stocks here that you will want to add to your watch list. I like WNR, having shown it up week after week, on technical screen after technical screen. The proprietary indicators I run on it show just such leadership, but I think a dip is possible. Yes, a dip to slightly below the 200-day moving average is likely. As long as gasoline prices keep increasing and oil prices are contained, WNR should be be a real winner.